It’s been one heck of a trying off-season for the JGRMX/Yoshimura Suzuki team. Losing title sponsor Autotrader.com sent the team in a search for sponsorship and also a journey through its internal budgets, trying to keep an expanded roster on board. Just a year ago, Suzuki granted JGR the full factory effort, and with it came a full four-rider 250 team, a second team semi, and several new staff members. Then JGR got a gift on its doorsteps when Chad Reed showed up for some testing with the team in late summer, and then stepped in as a replacement rider for Weston Peick for the final round of Lucas Oil Pro Motocross. The race went well, and JGR and Suzuki wanted to keep Reed on the team for 2019, but Justin Hill and Peick were already signed. The budget to add a third 450 rider wasn’t there, a fact only strained further once Autotrader was done. Could they add Reed? Could they even keep the new 250 program going? In the meantime, the team tried to function as if none of this was going on. Reed kept on testing and racing off-season events with full support, and four 250 riders kept testing even though only new recruit Alex Martin was 100 percent assured of a 250 deal. From what I could sense behind the scenes, there were some stressful moments as JGR and Suzuki tried to hash together the details and hang on. Maybe the JGR unit could just fund some extra effort until another sponsor could be found, but remember, NASCAR business isn’t as robust as it once was, either. Trying times all around. Then it got uglier. Weston Peick and Justin Hill were late additions to the Paris Supercross, and it turned horrible when Peick went down with huge injuries. He’s making a recovery now, but it was scary for a while, and his future racing timetable is far from known. On that weekend in Paris, though, it wasn’t even about racing anymore—it was just about Weston. 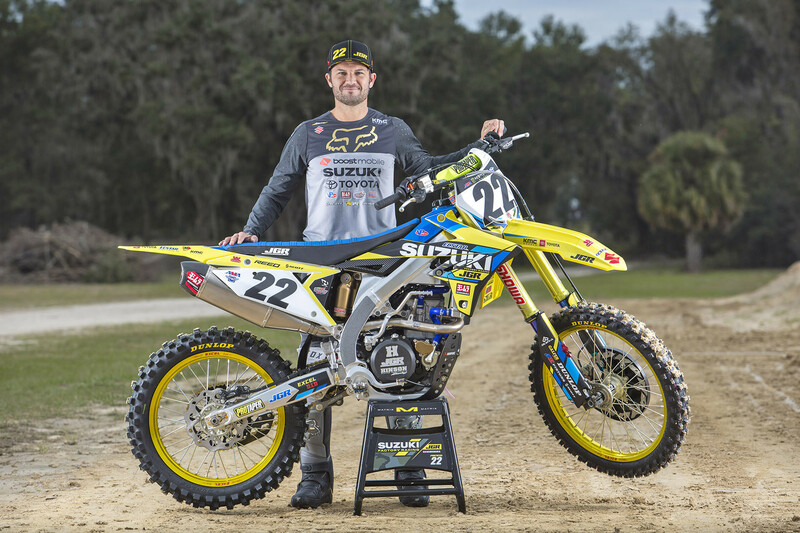 Some stress seems to be relieved via today’s team announcement, the first official word from JGR and Suzuki for 2019 (Answer announced it would be the 250 team gear sponsor last week, and listed Martin, Jimmy Decotis, Enzo Lopes, and Kyle Peters as the team riders). With Peick out, Reed is now officially in for Monster Energy Supercross alongside Hill on the RM-Z450. As for that four-man 250 effort, they’ll be on board the redesigned RM-Z250. The off-season goal for JGR was to operate as if everything was going fine, so the riders and staff would be 100 percent prepared for the season. Further, I have to imagine that, in the end, team owner Coy Gibbs simply decided he was going to continue to do this effort at its peak, and made it happen. Kudos for that. Now that it’s all behind them, can they shrug off the stress and perform once the lights are on in Monster Energy Supercross? At least the team is still going racing with its full platform. This might be the only squad that’s actually more relaxed come race day at Anaheim than it was during a testing day in the off-season.